At Blue Margin, we eat our own dog food. We use Power BI dashboards to track our productivity. Take a peek to see how we keep our engineers and their projects on track. 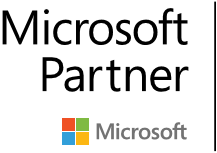 Blue Margin, Inc. is a Microsoft Gold Partner specializing in data analytics using Power BI. We help companies improve profitability through better use of their data. 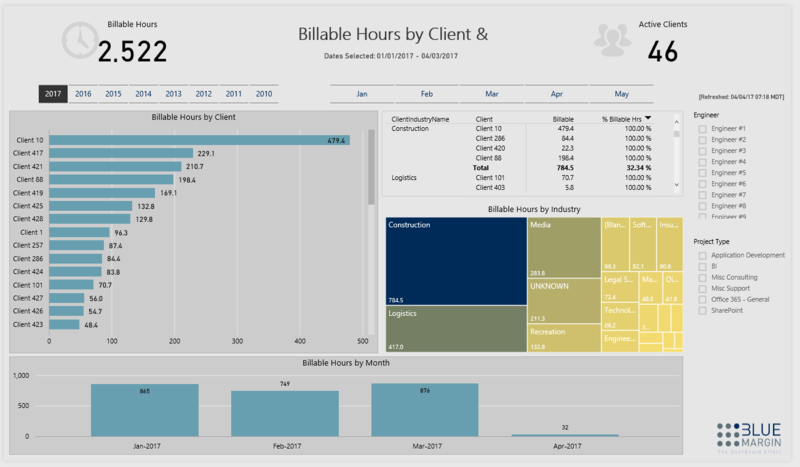 As business intelligence consultants, we use Power BI dashboards to track our work. On the front page of our company portal (a SharePoint site), we display our project production metrics front and center. And because transparency is one of our corporate values, we display those dashboards in real-time on a TV in our main office area, and we're sharing them with you now (note: we’ve changed client data to respect confidentiality). With as many as 30 active projects, with varying project scopes and deliverables, efficient management is imperative. 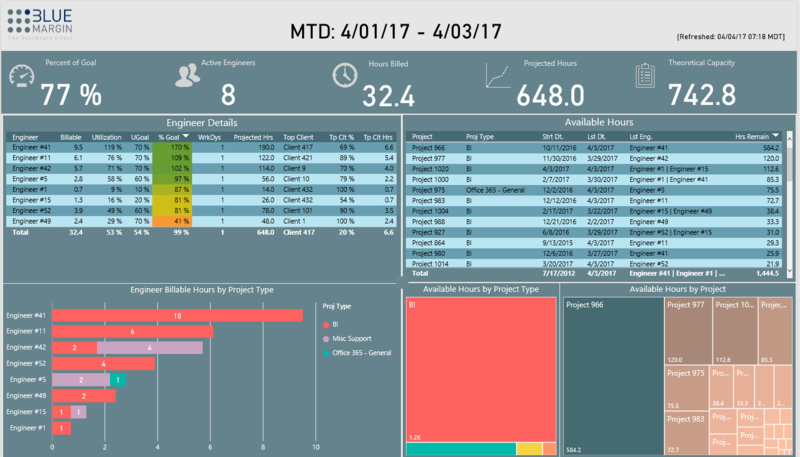 Although we long used mainstream project management tools, before our dashboards, we lacked an effective mechanism to track employee utilization, billable hours, and time estimates per project. The problem was that we often got so caught up working IN projects that we neglected to work ON our systems for delivering projects (a common problem, we know). After identifying our key numbers, we connected our data warehouse to relevant transactional systems (e.g., Freckle Time Tracking, SmartSheet, SharePoint, Excel, etc.) which fed our data into Power BI. We then embedded our dashboards onto the home page of our company portal, and made that page the default for every employee's browser. The result? We now have insight into our business that led to serendipities we never expected. For instance, although our engineers have always been productive, it used to require micro-management, and still their utilization rates hovered below 50%. Now, with a scoreboard that makes their goals crystal clear, and their progress certain, we have been able to increase each engineer’s utilization rate significantly, while increasing their ownership of their work. • More two-way conversations between engineers and project managers about billable hours, to ensure no one is left without, or overwhelmed by, work. • Better assurance each project is on track and does not exceed the number of hours remaining. • Company-wide insight on how much work remains on each project, and where engineers can plug in when they have capacity. • Transparency for our clients on billable time and time remaining on a project, or sub-categories of a project. Most unexpectedly, we created a healthier sense of accountability within our culture. Our engineers are now more motivated to be a productive member of the team because they can empirically see how their individual efforts drive the company forward. 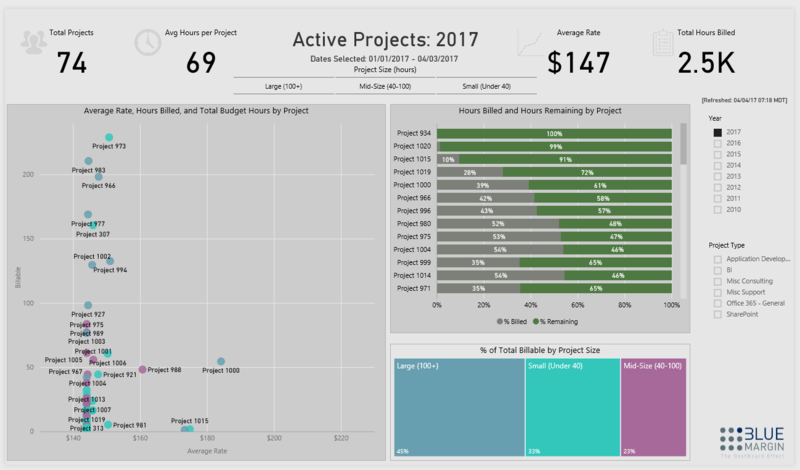 Using Power BI, Blue Margin transformed our own internal data into a strategic asset, empowering our project managers and employees to make informed decisions about our productivity. Gaining actionable, new insights from our operational data shows just one of the high-impact values of Power BI.